(In Vernal, Utah,) we had entered the world of (Ernest) Untermann. Ernest Unterman was a friend of Jack London and translated London’s works into German. He was an ardent Communist who also translated Marx into English. Born in Germany in 1864, Untermann went to sea on American sailing ships at the age of 17 and had the misfortune but romantic good luck to be twice shipwrecked in the South Seas. After the second wreck, he drifted alone in an open boat for 21 days before washing ashore on an island. He lived with locals for more than a year before being rescued. By the time he was 29, Untermann had come ashore, studied geology and paleontology, and was working in the Rockies, briefly visiting Vernal in 1919. This was followed by stints in the 1920s and 1930s collecting zoological specimens for scientific supply houses in Brazil and East Africa. 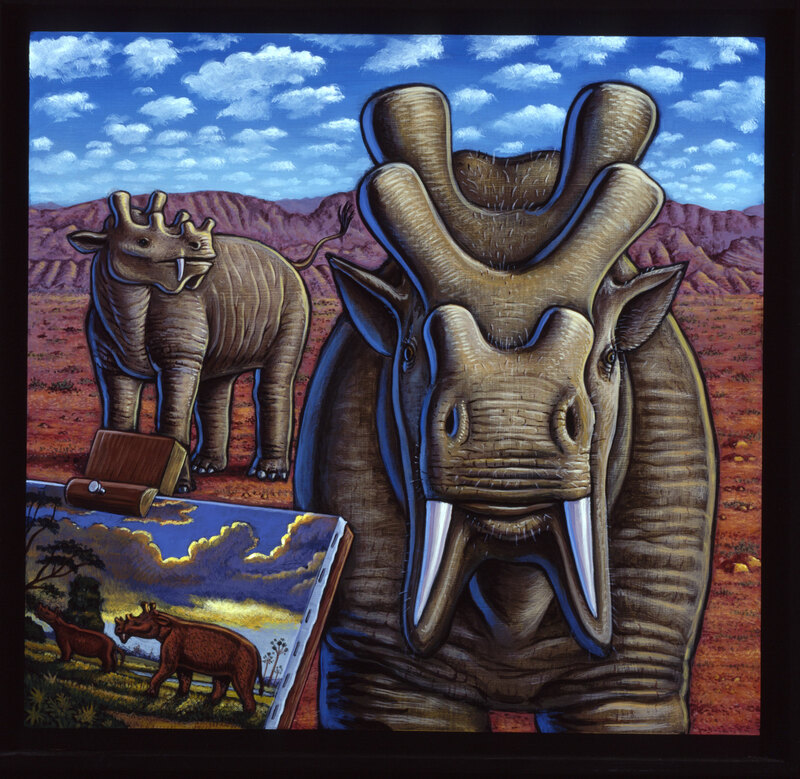 His interest in paleontology and animals led him to pursue art. He studied at the Chicago Art Insitute and later under a painter named William Heine, who was famous for painting grand battle panoramas. Tireless and versatile, Untermann embroiled himself in politics on one hand and animals and art on the other, ending up as the director of the Milwaukee Zoo. In 1940, after a controversial tenure no doubt soured by his politics, he retired from his position and, in his 75th year, moved to Vernal to be with his son George, also know as Getty, who was a ranger at Dinosaur National Monument. In 1945, when the (Vernal) Field House opened its doors, Getty was appointed its first director. Getty’s wife, Billie, was named staff scientist, and old Ernest was appointed an unsalaried staff artist. While dozens of the paintings were hanging on the walls of the museum, there were scores more gathering dust in the museum’s antiquated attic . . . . (When he saw the paintings), Ray was in heaven, trying to channel Untermann through his images of Eocene mammals. We found an amazing self-portrait of the old commie with a tiny uintathere posed regally above one shoulder and a snarling Allosaurus gnashing its teeth over the other. “Oh, my God, it’s like Van Gogh with dueling muses,” Ray murmured. He had clearly met his own muse, and we spent the afternoon pulling one masterpiece after another from the rickety rope contraption that held the frames. This entry was posted in Art, Travel, untermann, utah. Bookmark the permalink. Would you be interested in parting with one of them? Hi my name is rick, I’m a descendant of mr Untermann, to make along story short I have some paintings l don’t think anyone has ever seen these. They are of cavemen and mountain scenes. They range from 1930-1934, I have never contacted anyone about them but often wondered if anyone would like to see them. If so please email me. They are amazing paintings! The local Heritage Museum in Vernal had some restored and they have such brilliant color and are so impressive. Love them!!!! Bidibidi: A New Concept for Refugee Settlement?